These recordings of Dr. Bop are extremely rare and except for your site, I have never found one on any other air check site. Just a little background in case you are unaware, Dr. Bop was a local Milwaukee African-American deejay who was a mainstay on WAWA-AM and FM for many years during the 60’s and 70’s. WAWA was a small local station that was aimed at the black community but became a “cult favorite” of mainstream suburban white kids (like myself) who enjoyed the soul music sound. His real name was Hoyt Locke and he died in 1976. The Dr. Bop Intro MP3 is basically Bop launching into one of his famous poetic monologues he was famous for. 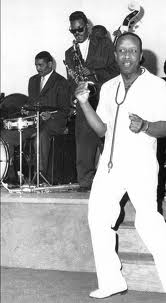 The Dr. Bop Master MP3 file is a long clip from one of his shows during which he was interviewing a black soul group called “The Mark IV” who were appearing at a local black lounge. I know that the songs played during air checks are usually cut out as the focus is on the DJ himself, however I left them unaltered in these files as Bop was famous for his “talking-over” songs while they played. Thanks for getting this up so quickly Steve. Everything working fine on my end. Only issue I see is that you have my first name listed as “Steve”. oh… oops I’m sorry will fix right away! Still, kids did listen to Dr. Bop. Bop and (a very young) Tex Meyer (1340-WRIT) would always trade barbs – always friendly/kidding. Bop had a hand in quelling Milwaukee’s riots in ’67. Documented in the Milwaukee Journal of that time. When he passed away, untimely, WAWA still played the “Dr.Bop rap” until requested by the family to remove it. Still, though, I can remember people calling and crying that they could call Dr.Bop and talk and there was that listener connection. Callers crying was not uncommon. The jingles used were PAMS “Gettin’ It Together” package. Thank You!!! Too many back in the day thoughts going through my mind. I had the opportunity to meet Dr. Bop. He lived on 20 th st.. in Milwaukee , I had worked next door doing a job, he came out the back door from his house wearing all white along with a white brim hat. His car also was all white with white leather interior. I was in my teens at the time and listen to his radio station wawa. He gave me a tour of his basement where he had hundreds and hundreds of 45s on racks. I am just grateful for that time in my life that l can cherish those memories. The Good-Doin’ Dr. Locke was kind enough to let me spend almost 3 hours in the WAWA studio… November 1968. We talked about Black Power in Milwaukee, the great divide that still divides us, and music. An incredible day for a mixed 17 year old kid living in Waukesha. I currently play in The Dr. Bop Memorial Jam Band. I am the onliest member, but we play old time blues with a Dr. Bop flourish. WAWA was a guilty pleasure for a soul music loving white kid in the early 60’s. Dr. Bop was the DJ to listen to. My favorite routine was his; There ain’t nothin to it the way I do it, I do it so fine each and every time , ’cause I’m qualified. He did it fast and it took a while to learn it but 50 years later it’s still with me. I’m a stone lover and an ex golden glover, I should have been triplets, because no cat should be so cool. I liked Dr.Bop because on his show he had you can iron while you earn that time of the show he was giving away money for you being the nineth caller. What a treat to listen to Br. Bop again. I remember getting out of high school and the radio dial went right to AM1590 for the drive home. Dr. Horaio Bop had a famous one-liner he would occasionally put on air…..’From Waukesha to Arkansas……from Whitefish to Cudahy…the Dr,Bop show knows no race,no creed,no colour”……..WAWA-AM WestAllis/WAWA-FM Milwaukee! WAWA 1590 The best radio station and D J the city of Milwaukee ever had and will ever have, Dr Bop always said like it should be said and told it like it was. As Dr Bop always said I got a rap so neat it can’t be beat with a lov makin so strong it makes the best of women do wrong. Remembering this great radio. He was a keeper. Little Artie was his hero. If you were a white kid in the early 60’s and into soul and R&B,the only station you listened to was WAWA and especially the Dr. Bop show. I remember going to Milwaukee auditorium the see Bobby Bland little Jr. Parker. We were the only white kids there. Dr. Bop and O C White were the announcers. No problems at all. A night I will always remember and that was in 1963. Thanks for these sound checks. Brings back a lot of good memories!